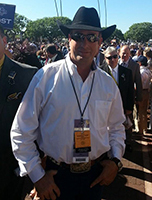 Danny Pish at the 2013 Breeders' Cup. (Grand Prairie, Texas - May 16, 2014) - Trainer Danny Pish scored his 500th win at Lone Star Park tonight when first time starter, Macho Borracho closing strongly under jockey Jeremy Collier, drew away to win the eighth race by an impressive 5 1/4 lengths. Pish scored his first win here in 1997, Lone Star Park's inaugural season, with a horse named Momentoflove. He had just eight total entries that year, and Momentoflove was the only winner among them. Since that first season at the Grand Prairie track, Pish has entered a total of 3,168 starters and has amassed earnings of over $8.5 million. He has been in the top 10 trainers standings of every meet beginning in 2000 and continuing each season through 2013. He won his first training title here in 2012 with 42 wins from 195 starts and earnings of $525,387. Only two others have hit the 500 Lone Star Park wins milestone - trainers Steve Asmussen and Bret Calhoun. Danny Pish completes the elite trainer's trifecta!